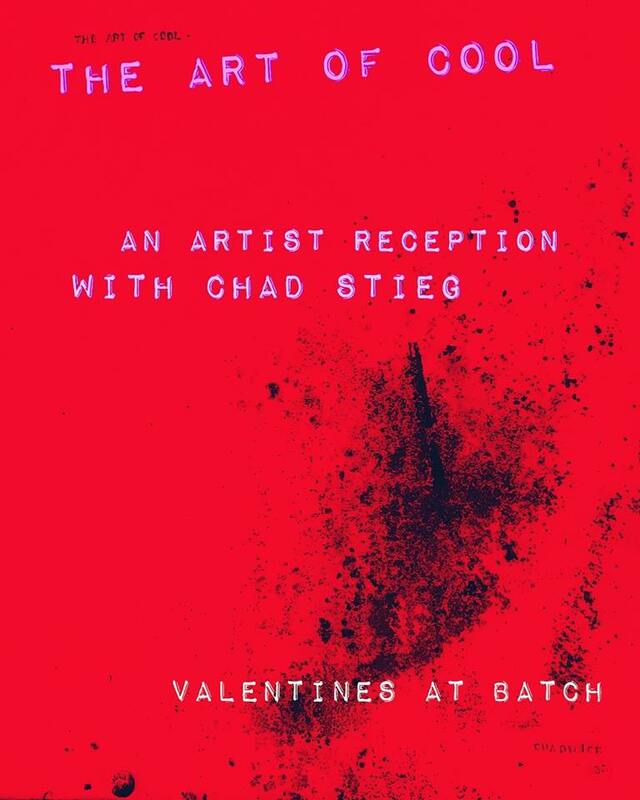 Carbondale, Co – Batch, the downtown tasting room for Roaring Fork Beer Company, hosts “The Art of Cool,” an artist reception for locally loved artist, Chad Stieg, on Valentine’s Day, February 14th, at 6pm. Aly Sanguily, Batch’s tasting room director and curator of show, says, “The Art of Cool,” has been a long time coming with Stieg. “I have had the pleasure of showing Chad Stieg’s art in the tasting room for RFBC for almost four years now, starting in our original location on Dolores Way. It’s taken me four years and a new location (and some begging) to finally make this show happen and I could not be more excited or honored.” Permanent gallery space has been given to Stieg since Batch’s opening in June of 2017, as the walls of Batch host mostly Stieg’s work year-round. Other works in Batch can be found by Chris Erickson (Carbondale, Co) Donnie Henry (Houston, Tx) and Brian Colley (Carbondale, Co) on a rotation with some pieces belonging to Batch and in Sanguily’s personal collection. satisfying feeling. The people in this valley have a love for art I haven’t seen in even the big cities I’ve lived in,” says Stieg. Stieg has been creating art for over 21 years, with 15 of those years as a professional artist; his medium lies mostly in acrylic and oil with a dabble in metalwork and carpentry. When asked about Stieg’s artist style, he says there’s not a lot of in-between. “My style is modern abstract landscapes to intricate stencil art. My art tends to be super tight, or super loose,” says Stieg. Stieg’s message with his art aims to remain simple yet evoking. Native American imagery, nature, guns and humorous text can be found in his work. “I was raised in a home that was influenced by Native American teachings, art and spiritual ideas. It is such an intense period of history and I just like to memorialize it in my own way. Birds are just relaxing to look at. And guns…well, they just make for interesting subject matter and usually start a pretty comprehensive conversation,” says Stieg. Sanguily has curated over a dozen art shows from her previous tasting room space to her current space on Main Street and she says it happened with intention. Sanguily says, “I have a degree in art, painting specifically, but I’m in the beer game, not the making art game. So, to fill the void of not having time to create art of my own anymore, I found that I had this really great space at Batch (and my previous space on Dolores Way) that people were really drawn to and I wanted to make a connection with the art of making beer and art itself. I found my favorite artists and I’ve sort of just given them priority in the space.” Stiegs art is clearly a favorite. The connection is apparent and felt deeply when guests walk in the door. “Brewers are craft makers, they are artists in their own right, so I thought, this is a really great opportunity to bring the two together with some sort of real meaning and I have this unique space to do it, it’s been a happy pre-mediated accident of sorts,” says Sanguily. Guests oftentimes order a craft beer and then take themselves on a self-guided tour of the tasting room space, as aesthetics of the space do not go unnoticed. Aesthetics is a passionate part of the Batch experience and Stieg’s art has been a profound part of that experience even through the welcomed transitions in his art. “I have a core concept of art that I revisit every so often. In-between those spurts I experiment with random transitioning, and if successful, those become part of the core creativity, as well,” says Stieg. A very special “Ramen Family Dinner,” will also be part of the evening’s festivities with a ramen dinner made in house by Batch’s new eatery, Carousel 42 and Executive Chef, Josh Rutherford. Reservations for the Ramen Family Dinner must be made in advance by calling Batch, less than a dozen seats remain. The evening is open to the public.